(CNN) – Former Defense Secretary Donald Rumsfeld, who along with President George W. Bush helped send the United States military action in Iraq and Afghanistan, said in an interview Wednesday the White House has yet to justify potential strikes in Syria. And he sharply criticized President Barack Obama’s administration for allowing details about that potential military action to become public before any decisions have been made. “I can’t imagine what they’re thinking, why they would want the Assad regime to have crystal clarity with respect to what they intend,” Rumsfeld said in an interview on the Fox Business Network. Obama told the "PBS Newshour" on Wednesday that he hadn’t yet made a final decision about U.S. military action in Syria, though U.S. officials have been cited widely in news reports pointing to cruise missile attacks on military facilities as a likely American response to alleged chemical weapons use by the Syrian regime. Acknowledging it was difficult to fully ascertain the administration’s thinking as an outsider, Rumsfeld maintained it was puzzling the amount of information that’s made its way to the public. "The idea of demystifying for the enemy what you're going to do is mindless,” he said. 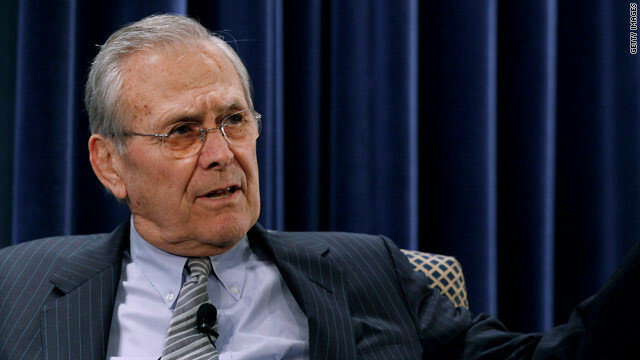 Rumsfeld served a secretary of defense from 2001-2006, a period that saw the U.S. begin wars in Afghanistan and Iraq. He said in the interview, however, that current statements from Obama and his aides haven’t met the threshold for intervention in Syria. He added that Secretary of State John Kerry, who left the U.S. Senate earlier this year for the top diplomatic post, had been “dealt a bad hand” by his predecessor Hillary Clinton and Obama, who he claimed had created a global leadership void. I like how people can pretty much agree that Rummy and Bush were total messes but at the same time people can't accept that Obama is doing the same exact stuff. From economic failure to warhawk foreign adventures Obama and Bush are identical. Wake up you fools, the Dems and the GOP are leading us straight into another catastrophe. At the rate the Dems and GOP are taking this country into the gutter America probably only has 20-30 years left in her, and that's a generous estimate. We have to turn this ship around before its too late. No more Bush-Obama wars in the middle east, and stop funding our enemies while our country is broke please. Moron should keep his mouth shut. Is this a joke? What does Rumsfield know of justification? This coming from the same guy who said Iraq had weapons of mass destruction. Hey Donald! Did you find those Iraqi WMDs yet? He has zero credibility! Who cares what Bush, Cheney or Rumsfeld has to say? Please remind them they are retired, they can not rewrite history, they were a disgrace and they need to stay out of public life. Syria DEFINITELY has chemical weapons, and isn't afraid to use them, but that isn't a good enough reason to bomb them. Iraq, on the other hand, had apparently run out of chemical weapons by the time we got there, but it was totally justifiable to attack them. And somehow, invading Iraq was in our best interest, but Syria is none of our concern. I might be able to agree that Syria isn't really our problem, but I still fail to see how Iraq was our problem. The major difference is that Iraq is still our problem eleven years later, whereas Syria will no longer be our problem after we bomb the bejesus out of them, and that will likely take less than 90 days. Rumsfeld has zero credibility following the outcome of the war he authored. He is certainly no Nostradamus. Might as well believe the opposite of what he says. They were good enough for you! A homeless man off the street has more credibility than this fool. Hell both my ex-wife’s can cook better then Rumsfeld can run a war and my first wife thought whole egg included the shell and my second wife could burn water if she could figure out how to turn on the stove.